Off the bus, off the bus. Sunglasses down against the washed-out Texas morning, the climbing white sun. A denim sky, 360 cloudless degrees. And tilting against it, a shuddering lattice of crossed steel beams, ascending above a prolix cluster of clattering machinery, logjams of rusted steel pipes, a loose dusty square of unvegetated land. Forty environmental journalists fan out around the ensemble, drop to a knee to snap pictures, jot chickenscratch on forty notepads balanced upon forty upturned palms. 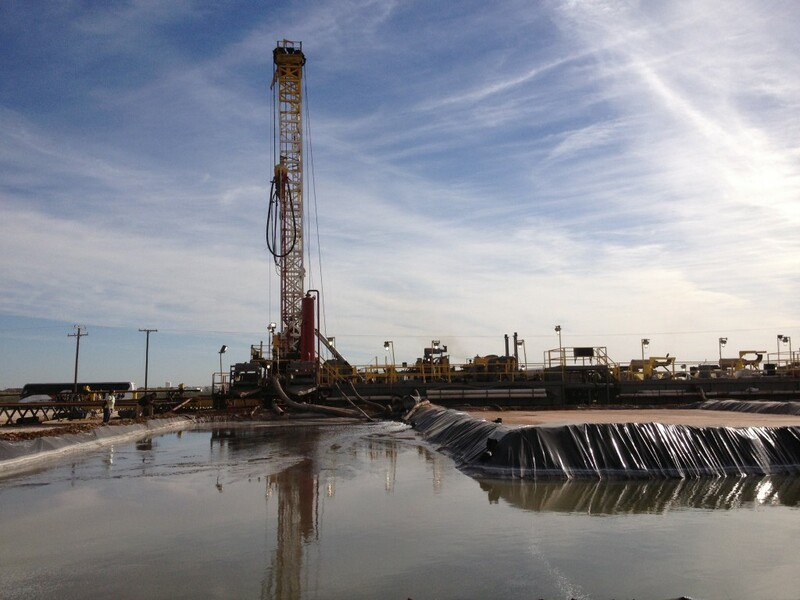 So this is what a fracking rig looks like. Well, so, not exactly. 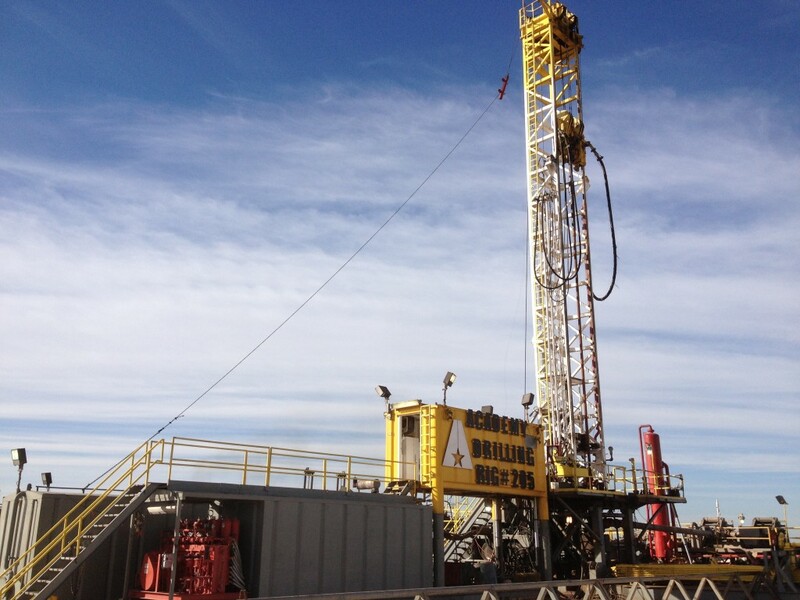 This rig is owned by Windsor Energy, and they’ve contracted Academy Drilling to slurp out the easy-to-get stuff through conventional extraction methods. The fracking won’t start for another week or two, long after the Society of Environmental Journalists has dispersed around the country and gone back to their local beats, forgotten about this baked corner of West Texas. We were supposed to visit a real-live fracking site, but at the last minute the operators got cold feet about letting two-score environmental writers crawl over their rig. Can’t imagine why. An industry representative emerges from behind a shed, radiating quotable authority, and we instinctively rush to him. An arsenal of tape recorders and microphones bristles in his face, every body rubbing against other bodies in the knot of reporters that presses tight around Ben Shepperd, President of the Permian Basin Petroleum Association, an advocacy group or a consultancy or something that, according to their website, provides “legislative and regulatory involvement and support services for the petroleum industry,” which as far as I can tell means searching for loopholes. 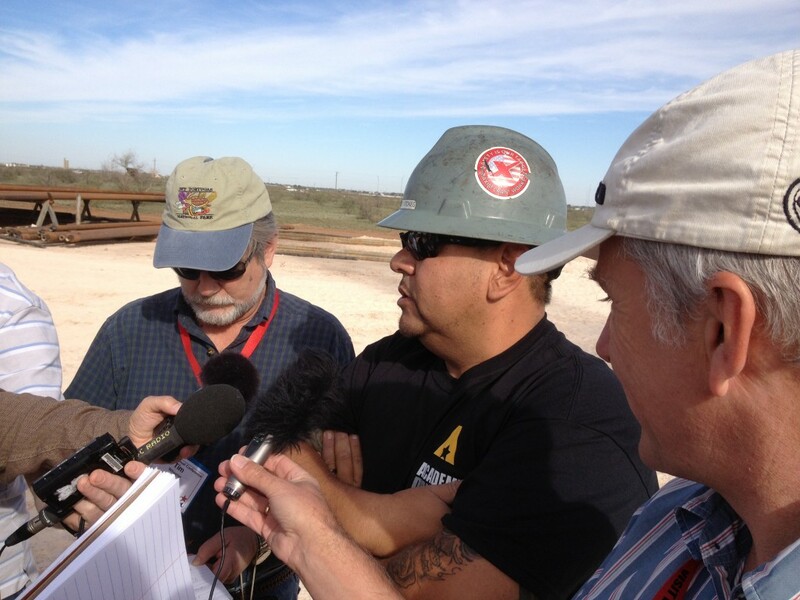 An oil company representative (not Ben Shepperd) is accosted by reporters. I wander away from Shepperd and toward the rig. The operation emits a constant, grinding whine that is a few decibels louder than ambient. Men wearing sand-colored helmets stroll around the decks of the rig twenty feet above me and appear to check some gauges. Anyone up for a quick dip? Rafts of milky scum swirl and collide like shifting continents upon the surface of the pond, reminiscent of the bacterial mats that cover Yellowstone’s geothermal features. A few reporters climb the embankments that surround the pond and gaze into its opaque depths. The pond is lined with a tattered plastic sheet that’s supposed to keep the mysterious fluid from leaching into the water table. The sheet does not look impermeable. Nobody, including Ben Shepperd, seems to have any idea what the scum is. Nobody wants to fall in. This can’t be the best system of disposing waste, can it? 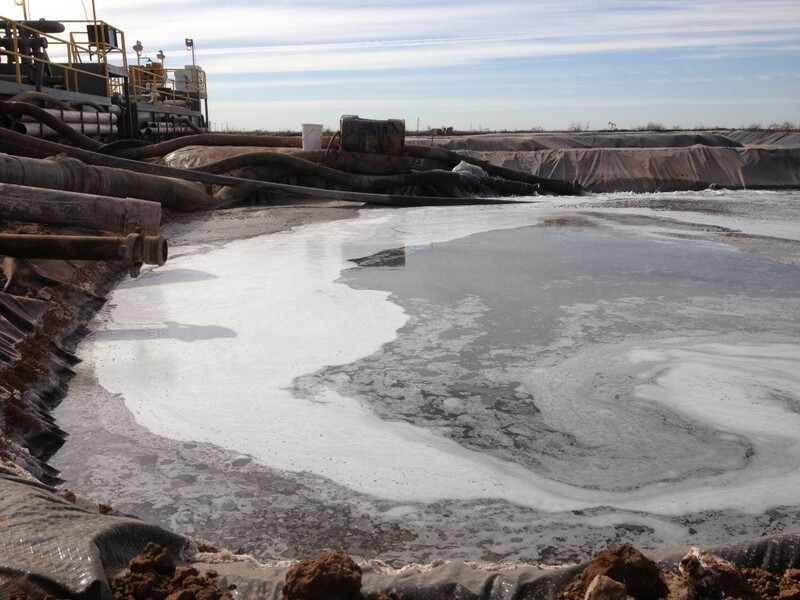 In New Mexico, the oil man acknowledges, they typically use closed-loop systems, whereby the water is separated from dissolved chemicals with a centrifuge and often reused at other drill sites. 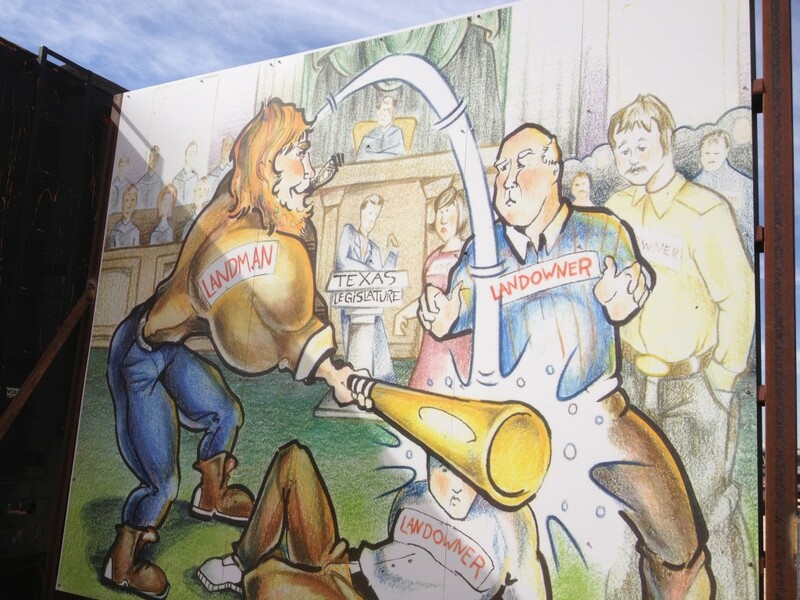 Companies in adjacent states also frequently store their wastewater in sealed tanks. So why stick with the open pits? I ask. The journalists are now scattered around the site like cats set loose upon the landscape. A man whose badge reads National Geographic takes the same picture of a flaking pile of abandoned pipes a dozen times. 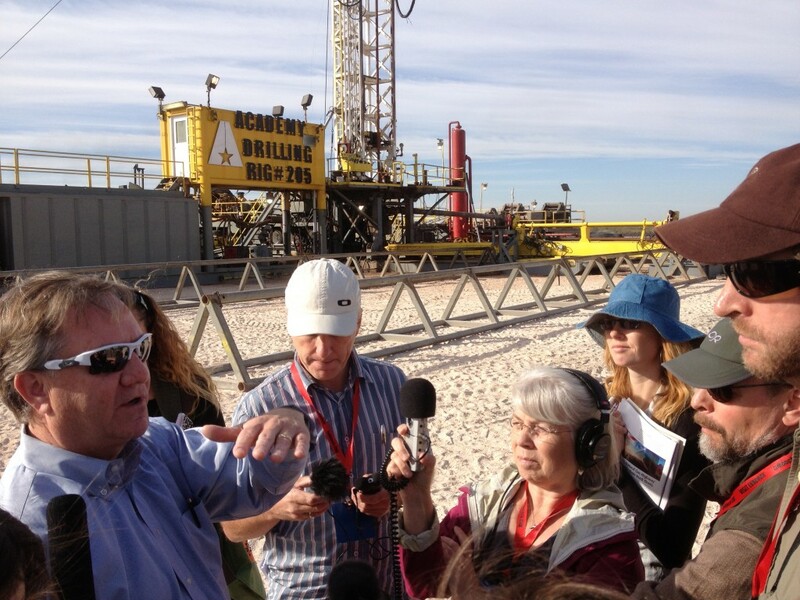 A woman whose badge says Freelance Radio Reporter holds a fuzzy microphone into the wind and intently records the squeal of machinery. I look back to the NatGeo guy and realize he’s now photographing me; obligingly I gaze out at the scrubby dun horizon as though observing a distant hawk surfing a thermal. In reality, there are no birds. What there are are pump jacks in every direction, nodding rhythmically like herds of browsing dinosaurs. A reporter with a faint German accent holds a tape recorder to the mouth of a bowling ball-shaped man whose shirt reads “The A-Team!” The A stands for Academy Drilling. On the man’s helmet is a strip of tape that identifies him as Wylie Stokes. Blurry biceps tattoos peek out from beneath Wylie Stokes’ sleeves. Everybody, it seems, works in oil fields here –– even the leaders of the nearby Gardendale Accountability Project, a non-profit campaigning against Berry Oil’s predatory land practices. Turns out that in Texas, surface and mineral rights are separate estates: just because you own your land doesn’t mean you own the fossil fuels beneath it. And here’s the kicker: the right of oil companies to access their minerals often takes precedent over landowners’ surface rights. If you happen to wind up living on top of their oil, well, that’s tough luck for you. Put it together and there’s not much they can’t do on other people’s land. A man named Hector Rodriguez gets on the bus and tells us that Berry Oil put a stake in the middle of Rodriguez’s six acres and told him he couldn’t do anything to develop his own property. Not that Berry is about to start drilling there anytime soon, but they might change their minds someday, and they don’t want, say, a house impeding their operations if they do. The Landman: destroyer of worlds. Still, whether the wells are vertical or horizontal, hydraulic fracking is unavoidably a water-intensive operation, and that’s a whole ‘nother problem. Wood directs our bus to another well, one which is actively fracking. We stand outside a rusted fence and watch the workers ignore us. On the dusty wellpad stands a row of giant steel tanks containing fresh water almost certainly pumped from the vanishing Ogallala Aquifer. Wood says that the oil company recently began drilling on his neighbor’s land, and Wood’s own water well dropped 12 feet almost as soon as the fracking started. Have there been any concerns about human illness among the workers linked to these drilling efforts you’ve so eloquently described and photographed? They bring shame upon the burrito. But seriously, this is a great piece of insight, Ben. Great piece of writing on an environmental tragedy in the making. Keep shining the light on this one.